String quartets are proliferating in Bay Area art spaces almost as fast as upscale food carts on street corners. Only five years ago, the San Francisco Friends of Chamber Music, a local chamber music service organization, counted 10 professional string quartets in the region. Today there are 25. Ever since Joseph Haydn popularized the form in the 1700s, the string quartet (which typically consists of two violins, a viola and a cello) has become one of the most important and beloved chamber music genres. Nearly every major composer in Western classical music history has written at least one string quartet, and in the Bay Area, string quartets, anchored by the internationally acclaimed Kronos Quartet, are thriving. Many have an innovative bent, demonstrating how creative programming coupled with entrepreneurism can keep a venerable art form vibrant for new audiences. Few quartets enjoy the status of the Kronos Quartet, the Grammy Award-winning ensemble that has commissioned 700 works since its inception in 1973. The nonprofit organization, with a $2.3 million annual budget and nine staff members, has done much to define the 21st-century string quartet. Its eclectic output encompasses film scores (“Requiem for a Dream”), dozens of recordings and innovative programming like concerts featuring collaborations with activists and thinkers from beyond the world of music like Howard Zinn. 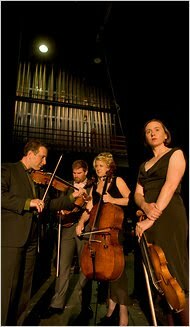 But beyond Kronos, an astonishing array of eclectic string quartets make their home in the region. Performances happening over the next few weeks testify to the depth and liveliness of the scene. Friday’s concert at the Herbst Theatre by the Turtle Island Quartet, one of the longest-running groups devoted to merging classical music with other styles like jazz, rock and bluegrass, will feature an arrangement of the Jimi Hendrix rendition of “All Along the Watchtower” in collaboration with Mike Marshall on the mandolin. The Del Sol String Quartet’s concert next Wednesday at Hub SoMa, a multimedia art space in downtown San Francisco, includes a piece for strings and didgeridoo. The Alexander String Quartet joins the scholar Robert Greenberg to explore the chamber music of Antonin Dvorak at St. John’s Presbyterian Church in Berkeley this Saturday and the following Saturday. And that’s to say nothing of the myriad high-quality string quartet happenings unfolding on a regular basis under the auspices of such presenters as Music at Kohl Mansion, Cal Performances and Classical Revolution, and the extensive tours undertaken by Bay Area quartets to other cities. With orchestras downsizing nationwide and fewer commercial opportunities available to Bay Area string players than their counterparts in cities like New York and Los Angeles, the string quartet has become an increasingly viable way for musicians to sustain a career. The size of a string quartet affords musicians creative possibilities they would not get in larger ensembles. “We learn more interesting techniques as a quartet than we would in an orchestra and have more authority to make artistic decisions,” Kate Stenberg, a violinist with the Del Sol String Quartet, said. The compactness also appeals to presenters. “A string quartet is pretty portable,” said Ruth Felt, the president and founder of San Francisco Performances, a presenter of chamber music concerts in the Bay Area. But survival isn’t easy. Revenue from CDs is down, and quartets typically command comparatively low fees, often footing their own travel expenses. (This gets pricey when you have to buy an extra plane seat for a cello.) “Even the highest-paid string quartets don’t make as much money as solo recitalists,” Ms. Felt said. The Bay Area’s string quartet culture is deeply rooted. (For many years, the San Francisco Conservatory of Music was one of the few places in the country offering chamber music studies.) Today’s ensembles are proving accordingly resilient. When the Cypress String Quartet was founded 14 years ago, its members decided to forgo outside work. After a period of living off their savings and going into debt, the group developed a commissioning and education initiative that has helped to sustain it. Titled Call and Response, the annual program links old and new music by commissioning composers to create pieces inspired by masterworks from the quartet repertory. The group performs outreach presentations in Bay Area schools and offers students free tickets to concerts. Ultimately, passion and comradeship are what drive these musicians — and their audiences — to get behind the string quartet as an art form.